Before you visit your client or prospect do your homework. Know what the country average SSI rate is and what the average cost per day is for a stay in the hospital. The number of inpatient surgeries performed each year. Their posted SSI Infection rate. 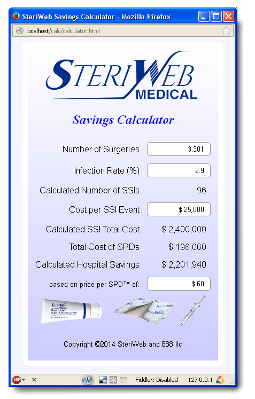 Get the estimated average cost per hospital stay or cost per day. Use an SPD cost of $60 per operation. Inpatient surgeries include all types. eg. ENT which may not have a high SSI rate. It's unlikely that you will get an order at the first meeting. Make sure you leave instructions on using the website calculator; they can then play with it themselves. Remember the USA infection rate is 2.3% while that seems low it means that 23 people per thousand operations have had their lives altered. Some for a week, some forever. SSI = Loss of Time and/or Loss of Income, but it could also mean loss of life or limbs. Also note that if a patient suffers an SSI, the average cost of treatment in a U.S. hospital is $25,200. Your goal and our goal is NO infections. It should be their goal too Why settle for anything less? Everyone you speak to in the hospital knows the SSI story! Now they will know the ending! With the introduction of the Steriweb Protective Device a hospital has no defense if sued for loss of time, limbs or life. 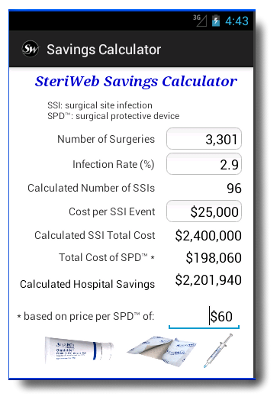 For your convenience, 888 llc has created an Android version of the SteriWeb Savings Calculator for use on your phone or tablet. NOTE: This installer is coming from an "untrusted" source as far as your phone/tablet is concerned, so one of the steps will ask you to give permission for the installation of apps from untrusted sources (in your Settings menu). This isn't a permanent change; We recommend you remove the permission once the app is installed. Go to your devices' Settings and scroll down to 'Unknown sources' and touch it. It will then warn you about untrusted sources; click Ok.
You may get a download dialog, or you may just get the download notification symbol in the upper-left of your device. Drag down your top bar and look for the notification that swCalc.apk has downloaded. Double check the date if you have multiple downloads of this file. The app should install with no problems. Fire it up right away, or look for its icon in your Apps. Return to your settings and uncheck the 'Unknown sources' to restore app security.